If you are suffering with sinusitis then The Online Clinic can help. 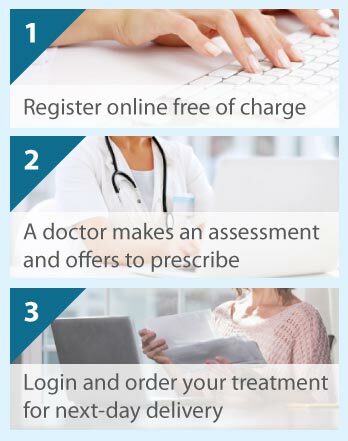 Complete a quick consultation online and one of our doctors will make an assessment and offer treatment. The sinuses of the nose surround the nasal cavities. They are air-filled spaces, lined by a thin membrane, which produces mucus. The mucus functions to keep the nose free of particles, and drains via channels into the nose. Sinusitis is inflammation of the thin membranes lining these cavities. When inflamed, these linings swell and this leads to blocking of the channels. Air and mucus therefore become trapped in the sinuses. Pressure and pain around the eyes and headache may result from trapped air and mucus. Symptoms include a yellow/green nasal discharge, blocked nose, decreased sense of smell, bad breath, and fever. Acute (short-term) sinusitis generally starts following an upper respiratory tract infection, usually a cold or flu, an infection of the teeth, or a fungal infection. Chronic (long-term) sinusitis may occur if acute sinusitis does not clear up. This may happen if you have allergies such as hay fever, allergic rhinitis, and asthma; or problems within your nose such as polyps (tissue growths) that prevent good drainage. Usually, you do not need to see a doctor as symptoms quickly resolve. However, you should make an appointment to see the doctor if the symptoms get worse, become severe, or do not improve after about 10 days, or the sinusitis keeps coming back. The symptoms of sinusitis and a nose examination enable a diagnosis to be made by your doctor. Referral to an ear, nose and throat specialist may be necessary if your symptoms are severe, recurrent, or long lasting. In most cases, symptoms of sinusitis disappear without a particular treatment. You can help your recovery by taking pain killers such as paracetamol to relieve any pain and reduce your temperature, and by using (for a few days only) decongestants in the form of nasal sprays or drops to unblock the nose and aid breathing. Cleaning your nose by flushing it with salt water and breathing in steam may also ease congestion, while warm compresses on your face may also help the pain and enable mucus to drain from the sinuses. Rest and keeping hydrated by drinking fluids are also beneficial. Symptoms lingering after a week or worsening may be treated with corticosteroid sprays and drops that reduce inflammation within the sinuses, and antibiotics may be taken to clear up bacterial infections. Antihistamines may alleviate allergy symptoms. On occasion, some people require surgery (called functional endoscopic sinus surgery) to remove any blockage such as a polyp and widen the channels to improve drainage from the sinuses to the nose.